Use a standard shampoo or pea size amount of (preferred) Dawn dish-washing liquid placed in the palm of your hand to clean your mineral makeup brushes. Avoid gentle or natural shampoos which can possess a lot of natural oils, coatings or waxes which will contribute to poor cleaning. Synthetic hair requires more cleansing surfactant than animal hair does to achieve best results. Now swirl and press soap and water through the bristles in your hand for even soap coverage, while keeping the brush ferrules angled downward so water does not enter the handles. Do not flare bristles like a fountain under the water or while forcing soap through them. Squeeze and swirl bristles in your hand under running water until the water runs clear. Wash and rinse again as needed. For all brushes, spread out a hand towel and then dry them by squeezing out excess water with a paper towel, then swirl and sweep back and forth on a hand towel to fluff bristles and help regain their shape. Allow to dry. Wash your brushes at least once per week for the cleanest application, or a minimum of twice monthly. This will maintain their resiliency to wear and keep them in perfect condition for applying your mineral cosmetics. Remember: All clean skin harbors a small amount of bacteria, so swirl brush in minerals placed on small plate or in jar lid for the cleanest application. We do not recommend touching brush to sifter. Also, keeping your brush clean removes built up sebum that can make for a stickier application of the powders, causing uneven shading and distribution of minerals. Velvet Texture Difference: Due to our velvet finish on the bristle tips, clean brushes will still have a soft waxy feel. This is what helps to hold the minerals for better application. The length of time a brush can go between cleanings will be subject to your application method such as damp vs dry. A foundation brush like a Kabuki or jumbo / flat top buffer will need to be cleaned more often due to the use of jojoba oil in our formulas. 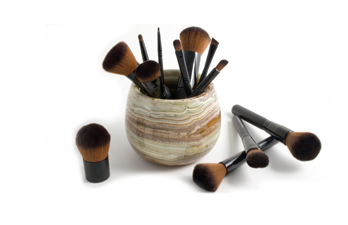 Other makeup application brushes will feel cleaner longer since all other formulas do not contain Jojoba oil.